GRANDE PRAIRIE NEWS - 2013 ARCHIVED Grande Prairie Dream Home. Videos. Jan 2013: There were 92 tickets handed out in Grande Prairie in 2012, for parking in Handicapped Parking Zones. The year before there were only 26 tickets handed out. The current fine is $150 but that will be going up soon to $250. -It is now official that GP Auto Group has purchased People's Automotive (Grande Prairie) from Kevin and Darlene Bathgate. Kevin started with People's Auto in 1980 as a mechanic, became a partner in 1995 and was full owner of the company since 2001. 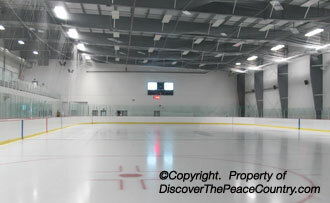 -The brand new County of Grande Prairie Sportsplex opens. Both rinks and the field house are now open with more areas open once they are completed. A Grand Opening will be held at a later date. Jan 2013: The new sign of RONA now replaces the Totem sign to indicate the store has now officially changed its name in Grande Prairie. - Tile Ideal is now open in a brand new building along the Highway Bypass Grande Prairie, just behind Mr. Mikes. - A new A&W is under construction 100 St and 81 Ave, north part of Grande Prairie, next to the Redwood Inn. The restaurant will have a Retro look to it. Feb 2013: A new A&W opened (Wed Feb 20) north of Grande Prairie across the highway from the County of Grande Prairie Offices and right next to the Redwood Inn & Suites. The Restaurant 's drive-thru will be open 24 hours. - In only 4 hours (Feb 13) Police in Grande Prairie handed out 157 tickets in 2 checkstops. 51 of those were for distracted driving, 83 for not wearing a seat belt, 23 for speeding - no insurance - unregistered - stop sign violation. Feb 2013: Peter Teichroeb (Happy Trails RV) has purchased the radio station 96.3 Shine FM in Grande Prairie. The radio station will now be an independent and the only changes that will be made is to the Shine FM name February 15th became 96.3 Reach FM. -White Orchid Bridal Boutique as opened downtown Grande Prairie. The new Bridal Store is owned by Nadine Stewart. -A group of local businessmen have purchased the Quality Hotel, along 100 Avenue Grande Prairie. There are plans for some renovations, and will re-open under a new name March 1st. Now known as the Paradise Inn and Conference Centre. This year the Dream Home was located in the Carriage Lane Estates. This subdivision is located east along 100 Avenue on the outskirts of the City. More information - prizes - tickets prices CLICK HERE. Mar 2013: Sound Waves, music store in Grande Prairie (108 Ave, 101 St) closes after 24 years at the end of the month. Vic Mark was the owner..
-Recently the Quality Hotel in Grande Prairie was purchased and now it has officially changed its name to the Paradise Inn & Conference Centre. There are plans on having some renovations. -The Daily Herald Tribune celebrated 100 years this year. A special get-together took place with staff and clients.- Byron Johnson passed away at the age of 75 years. He was the man behind BJ's Q Club which closed earlier this year after 20 years of operation. April 2013: Walter Paszkowski is retiring. He was the Economic Development Officer with the County of Grande Prairie for many years. He served as MLA from 1989-2001 and before that was Mayor of Sexsmith for 6 years. April 2013: -Recent survey shows Grande Prairie tops the list in throwing away the most recyclable beverage containers in Alberta (study of 9 landfills) 3 times more than Calgary or Lethbridge. -Sears in Grande Prairie has undergone some major renovations and it won't be that long before Target will open in the old Zellers location. -Evergreen Park Campground has changed its name and is now officially known as McGovern's RV Campground. May 2013: The Muskoseepi Park Pavilion is to get a face lift costing more than $700,000. The park is located in the centre of the City of Grande Prairie along 102 Street. VIDEO: The Everton Family of Hythe were honored at the Agri Show, Evergreen Park Grande Prairie. April, 2013: Hundreds of people of all ages took part in the 15th Annual Swan Festival held at Saskatoon Lake Provincial Park. Many exhibits were on hand while bus tours took groups to see swans in the surrounding lakes and fields. Housing Starts in Grande Prairie are up with 59 starts during the month of April. So far this year, since January, there have been a total of 160 starts compared to only 87 for last year. June, 2013: -Rentco Equipment will begin construction of their new building very soon to be located along 116 Street, Grande Prairie, just south of Future Shop. -The Grande Prairie Dream Home draw was made June 5, 2013 and the winner was Carmen and Steven Brown. The 125 thousand dollar 50-50 Jackpot was won by Steve and Kathleen Kushneryk of Valleyview. July 1, 2013: One of the most attended Canada Day Parades in many years saw thousands line the streets to see the Canada Day Parade in Grande Prairie. DiscoverThePeaceCountry.com captured the entire parade and you can view it right here. July, 2013: Phase One of the Westgate Centre is to open in September on the west side of Grande Prairie. Some of the first stores will include Bed, Bath & Beyond, Home Sense, Pier 1 Imports and Carters Osh Kosh. Aug, 2013: Some of the new stores are now open in the Westgate Centre. Pier 1 Imports, Bulk Barn, OSH Kos, and Home Sense are now open with more opening soon. The Source will be opening a location here as well. -Grand Banks is a new subdivision being developed just south of St Joseph Catholic High School, and the Coca Cola Centre. Roads and services are being put in. - A Blue-Green Algae advisory has been issued for Moonshine Lake, Swan Lake AB, and Snipe Lake. The toxins can cause serious illness to both humans and animals who come into contact with the water. This video takes a close look at Brownvale, Alberta. From the Mechanical Bronco Bull, to traveling downtown Brownvale, as well as a close look at the Historic Buildings in the Hamlet. This video takes a close look at the Lake, the beach and the campsites. There are a number of fishermen trying their luck on catching the rainbow trout. (Video July, 2013) Located 20 km north of Brownvale Alberta. 67 km northeast of Manning, Alberta. In this video, we view the campground area including the day use area where the remnants of the Old Trapper's Cabin still remains. Also we take a closer view of the River. 69 km west of the Town of La Crete is the La Crete Ferry. Also featured in this video is the Dunvegan-Thompkins Ferry that was used previous to the La Crete Ferry. Before 1960 it was used at Dunvegen and after 1961 it was used at the Thompkins Landing where the La Crete Ferry is now used. 24 km south of the Town of Peace River is one of the few remaining ferries in Alberta called the Shaftesbury Ferry. 20 NEW VIDEOS featuring the left and right side of the downtown of Grimshaw, Berwyn, Fairview, Rycroft, Wanham, Eaglesham, Donnelly, McLennan, Falher, Girouxville, Peace River, Nampa, High Level, La Crete, Manning, Spirit River, Woking, High Prairie, Valleyview, Grande Prairie. So far 8 teams have been highlighted on video with each player introducing themselves. You can now view the Dawson Creek Canucks, Fort St John Flyers, Hythe Mustangs, Manning Comets, Grande Prairie Athletics, the Spirit River Rangers, the Falher Pirates and now the Grimshaw Huskies. Dec 1, 2013: It was a stormy Sunday afternoon as many people of all ages gathered downtown Grande Prairie for the Santa Parade. DiscoverThePeaceCountry.com has again captured this event on video. Sept, 2013: Long time resident Ernie Radbourne has passed away. He started Ernies Sports Experts in 1968 and served 2 terms on Grande Prairie City Council. 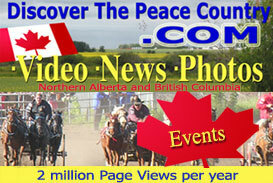 -DiscoverThePeaceCountry.com now features over 130 LOCAL VIDEOS. No other website in Alberta has so many local videos of the area. -New traffic lights will be installed in 2014 at the intersection to the Grande Prairie Airport along Highway 43. -September 12th temperatures reached 31.9 degrees in Grande Prairie which broke a record that stood for almost 70 years. -Louisiana Pacific has purchased all four of Ainsworth's Lumber manufacturing facilities, located in Grande Prairie, High Level, 100 Mile House, BC, and Barwick Ontario. Louisiana Pacific is a leading United States wood products giant. -Travellers in the area will be pleased to know the Tourist Information and Rest Stop located 1.6km south of Valleyview, will be remaining open year round. This is the first year they will be doing that as they normally close in September. Sept, 2013: The TEC Centre at Evergreen Park has been renamed the ENTREC CENTRE as ENTREC Corporation acquired the naming rights for at least 5 years. -ATCO Electric has opened in a new building 9602-123 Street, far west side of Grande Prairie. Long & McQuade Musical Instruments has moved to their new location at 10013-97 Avenue Grande Prairie. The building is the former BJ's Cue Club. Duke's and Mingles on Main (99 St and 101 Ave) will close as the building will be torn down to make way for the SAWMILL Restaurant to open in the spring. -Stelious Vasileiou has returned to Acropolis with business partner Scott Sargent after both of them had a short retirement. Scott is the same person who was part of Sean Sargent Toyota. Nov, 2013: Long term local businessman Orm Shultz passes away at the age of 81 years. He owned Warringtons Jewelery and Jonathan's Gold & Diamonds in the Prairie Mall, Grande Prairie. (one of the few non-franchise businesses in the City) At one time Mr Shultz was the sales manager of the Daily Herald Tribune. -Sterling Upholstery has moved to a new location, 11302-95 Avenue with ribbon cutting November 20th. -Countryside Motorsports is constructing a new building on the west side of Grande Prairie, just south of Peavey Mart/Princess Auto.- Another Dollarama has opened along 100Street Grande Prairie, just west of Home Hardware near 108 Avenue. Dec, 2013: Jack Wong, longtime resident of Grande Prairie passed away at the age of 86 years. He along with 3 partners opened the Golden Star Restaurant in 1971 and later the Golden Inn in 1981. (now known as the Paradise Inn and Conference Centre) -The Festival of Trees in Grande Prairie raised close to $350,000 for the QEII Foundation. The event takes place each year at Evergreen Park. COUNTY OF GRANDE PRAIRIE SPORTSPLEX Opens just west of the County Administrative Building (Clairmont, Alberta). Some parts are still under construction. View Photos: Front Entrance, Reception, Arena-2, Players Box, Access to upper level, Soccer Fieldhouse.